Stainless steel kitchen sinks sell like hot pancakes. After all, they are the widely preferred material for kitchen sinks. But, no two stainless steel kitchen sinks are the same. The difficult to avoid fact is that a coin flip won’t fetch you the best stainless steel kitchen sink that money can buy. The fact that you are reading this review tells us that you are well aware of this notion. So, let’s give you what you came here for. Yes, we will review the TopZero TZ.S773 Rimless Sink from top to bottom so that you don’t have to browse the web all day long to learn more about the sink. Where is the item manufactured? Does it look as shiny as the product images? Does it make a lot of noise? Will it last for a long time? Are we a happy customer? According to the makers, this isn’t your regular street-side sink. The TopZero TZ.S773 has a class of its own, all thanks to the smart engineering that went into the making of the product. 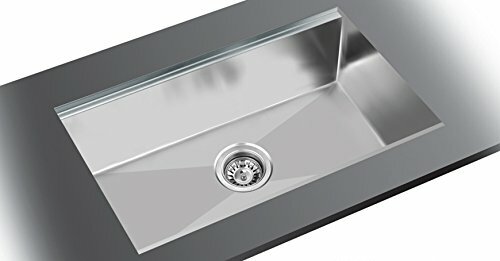 It’s a larger than usual single bowl sink that’s made from the finest stainless steel used in the construction of kitchen sinks these days. The sink is made from 16-gauge stainless steel material, which is often used for luxury sinks because it’s a better gauge than the rest. Simply put, the 16-gauge makes for a better quality sink. They last longer even after heavy use. When you drop heavy content on the sink, they are less likely to sustain dents or any other hazard. Therefore, it should be a no-brainer choice for harder-working kitchens. This sink is not developed in a remote city in China or any other place known for mass producing low-quality products. The product is made in Fort Lauderdale, USA, so the kitchen sink has superior quality written all over it. The look of the sink is like nothing else in the market. Believe us or not, the sharp look would instantly trigger a smile on a homeowner’s face. All credit goes to the exclusive rimless edge and the highest level of innovation that went into the making of the product. The sink’s size and capacity are unmatched in the market. It’s a large capacity single bowl sink that can easily hide plenty of kitchenware items of daily use, so the dishes in your sink may not seem like a big joke to your guests because they will be well-hidden from the visitors. Truthfully speaking, cleaning the TopZero TZ.S773 doesn’t involve too much of elbow grease. It cleans up nice and easy without any fuss, so the maintenance part is a no-brainer affair. Unlike the metals sinks, this sink won’t turn into a drum to amplify the sound. This sink is thoughtfully built with noise-reduction features, so the sink can naturally absorb a lot of sound without any hiccups. Frankly speaking, it doesn’t have any major imperfections or product flaws to talk about. It’s clear that the makers have paid attention to details to come up with a sink of this quality. The sink does not wear off easily even after years of continuous use. As you call tell by now, the TopZero TZ.S773 sink is a dream choice for the hardest working room in the home. If the sink were a person, it would have easily made it to the Forbes list. Nevertheless, it’s a superstardom product for us. We are deliriously happy with the sink’s looks and performance. Frankly speaking, we did a lot of research to narrow down on this kitchen sink, and it paid off well.